Toffee still comes to see us. But he still doesn't want to play; Mary and I don't know why. Chou jumps around, thrilled that he is there, and he wants to hide. I feel sad about that -- as if Chou were a little child and her best friend abandoned her. So being a concerned mother, I looked for other friends for her. "I'm Kathy. I have a cocker spaniel." "My name is Janet. I have a 4 year old pit bull." "My name is Jason. My dog is a yellow lab mix." "I'm LuAnn and I'm looking for a playmate for my shih tzu." "Hi. My name is Sylvia and I have 2 briards. One is a 12 year old male, and the other is a 3 year old female who is very playful." Jackpot! Within 20 minutes of my home, there were 2 briards I didn't know about, and they wanted to play! I answered her ad immediately. She was as excited to hear from me as I was to find her. And even more surprising, she was already Chou Chou's Facebook friend! 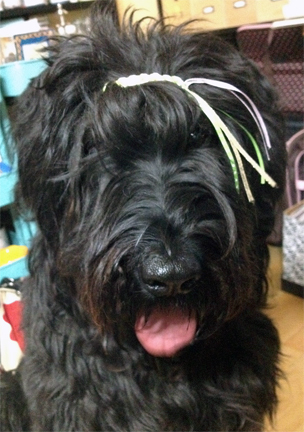 Chou has more than 200 Facebook friends, almost all of them briards or other dogs (and two cats) from around the world. Sylvia didn't know, and I didn't know, that we lived nearby. We made plans to meet. On the day of the visit, I drove Chou Chou to a little park near her home. I had been advised to let the dogs meet on neutral territory before putting them together in the yard. Lulu and Baxter got out of their car, and I greeted them before letting Chou out. Lulu bounced over to me with the happiest wagging tail. Baxter came over, too, but was less exuberant, as you would expect of a 12 year old. All seemed good, so I opened the door and let Chou out of the car (on leash). There was a little sniffing -- and then a squabble. One of them growled and then there was some lunging and air snapping. We separated them immediately. This was not the good start that I expected. Was Chou the growler? Maybe she was fearful because of being attacked a few months ago? Sylvia thought it was Baxter ("who is getting old and grouchy"). Everyone went back in the cars. We drove to their home and Baxter stayed in the house while Lulu and Chou Chou got acquainted in the yard. At first, Chou sniffed around the property and Lulu hid behind Sylvia. ("Oh, no! Not another dog hiding from me like Toffee! I don't understand! I brushed my teeth before I came!") Had the squabble at the park frightened Lulu? But soon after, they both walked around the yard, going their separate ways, but they got along fine. You're making me famous! Ohh la la! Let's try to get our Moms to set up a play date for next week! Hi Chou Chou! Just stopping by to say hi! You are one pretty girl!